He started young. 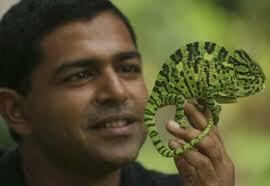 He has been handling snakes and other reptiles from a very young age- as young as 3 years. 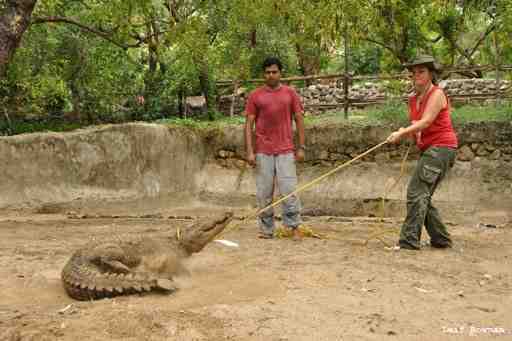 He has been working with Romulus Whitaker at the Madras Crocodile Bank since 1995. He is also a part of the conservation and education efforts at the Agumbe Rainforest Research Centre (ARRS) and the Andaman and Nicobar islands Environmental Team (ANET). After some of their work with the King Cobra was featured on the National Geographic Channel (NGC) in the late nineties, he was made the brand ambassador for NGC in 2000 for the next two years. This gave NGC an Indian face, and also contributed greatly to the awareness about conservation in India. Today, his is an easily recognisable face. With his vision of catching the next generations early, in an effort to educate them about Nature and the need for conserving it for the future of our planet, he is a wonderful role model. Meet Gerry Martin, Herpetologist, Naturalist and Conservationist. You can find more details about his work at his official website with more updates at the project blog. Why did you become a naturalist? For how long have you been doing this work? I've been completely enamoured by Nature for as long as I can remember. I've always been surrounded by animals and had pets. Growing up on the farm made it easier to connect with and relate to the natural world. Becoming a naturalist was just a logical progression. I started my professional life when I was 19 years old in 1995 by joining Rom Whitaker at the Madras Crocodile Bank. It is an unusual profession that you are in, Gerry. Could you tell our readers how you got into this? I wasn't very good at school and all I wanted to do was to work with reptiles and Rom Whitaker. So, I went over to the Madras Crocodile Bank and asked Rom if I could work there. I started at the bottom and Rom gave me all the breaks that allowed me to progress. Tell us about your work, Gerry. My work involves creating conservation solutions and involving the general public in it. We are in the process of tackling the problem of snakebite in the country now. Almost fifty thousand people die each year in India from snakebite. We are researching the various species and venoms causing the damage and also working with scientists to figure out how we can deal with this clinically. The other part to this work is a concerted education campaign about snakes, snakebite and first aid. We also enable research and conservation projects around India. People instantly associate your name with snakes. What about other animals? 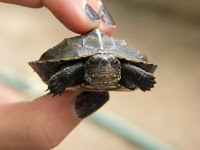 I'm a herpetologist. This means I work with reptiles and amphibians. I work with snakes, crocodiles, lizards, turtles, frogs, etc. We have seen you handling a spectacled cobra and a scorpion. It was amazing. Did you need to do any specific course or something to learn how to handle these dangerous animals before you actually started working with them? Nope! There's no such course. I started handling snakes when I was a child and just like any other kid who starts something early, I got quite used to it. It's just like learning to ride a bike! Is there anything you do specifically with children? I strongly believe that children connect very well with nature and that they don't have much opportunity to do so in today's scenarios. What we do with them is give them substantial experiences with Nature and wildlife while helping them build the skills that they need while exploring the outdoors and Nature. The workshops that we conduct are designed to help children comprehensively experience different aspects of wilderness and wildlife. Tell us about these workshops. Our workshops focus on various aspects of Nature and wildlife from herpetology and rainforest ecology to Nature photography and large game ecology. They are all hands-on and use real experience to help participants build not only skills in the domain but also in their own context. Participants get to be involved in real work and exploration rather than learning things through presentations and in classrooms. What is usually the response from children at your workshops? Children generally leave the workshops very satisfied, as the experiences they have are new and unique. Also, they are constantly learning through the workshop and this keeps them engaged and interested. Having said that, there are some children who have been 'sent' on the workshops against their will and they obviously have a bad time. It is really important that the choice to come along on the workshop has to be the child's. You work a lot with Romulus Whitaker. Could you tell us about this work? Rom and I work together on a few things every now and then. I have been working with him since the beginning of my career. Right now we are focusing on the snakebite issue. We've been running expeditions together and also steering a lot of this work as well. Reptiles are often viewed with fearful fascination. Do children's perceptions change after attending your workshops? Yes! Most of the fearfulness comes from ignorance. Once there is some real context and a guided experience, children learn that these animals are not out to get us and there is quite a charismatic enigma to them. Do you do anything similar for adults? Yes, we do! There are a lot of similar opportunities for adults as well. Many of our workshops are targeted at adults. There are many myths surrounding snakes and their behaviour. Have you encountered much of this in your work? How do you deal with it? These myths have come to be over hundreds of years. It is very difficult to break them. However, with repeated interventions and showcasing of examples that prove the myths wrong, people sometimes rethink their stance. Do you regularly get calls in the capacity of your reputation as the 'snake man'? Yes I do. I try to simply convince people that snakes (especially non-venomous ones) are OK to have around. How does one make out if the snake lurking in your garden/ car-park is a venomous one? You need to know what species it is. There are no rules that you can follow, unfortunately. Which snakes have you primarily studied? There have been a lot of species. I've been bitten twice. Once by a spectacled cobra and recently by a medo pit viper in Arunachal Pradesh while trying to capture it for our snake-bite study. Both times were because I made a mistake. 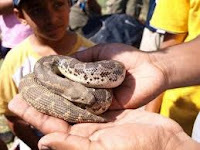 Tell us about what can be done in case of a snake-bite before the person can be taken to a hospital. The most important thing is to keep the patient as still and rested as possible. Also take out anything that might become constrictive like bangles, rings, watches, etc. Then the most important thing is to get the patient to the hospital as soon as is safely possible. It is also very important to make note of any symptoms along the way. Tell us about how snake venom can be safely collected, and its uses. The process of extracting snake venom is dangerous. Venom is used in the production of anti-venom and other medicinal drugs. There is also a fair amount of research done on various venoms, looking at what the numerous components can achieve and how they can be helpful medically. A word about snake charmers? I think all that needs to be known is that they defang snakes and end up killing them within a matter of weeks. They also prey on people's fears rather than rely on the truth about these spectacular animals. Your farm, Martin Farm, has become a 'must visit' destination for many Bangaloreans. Please tell us about it. The farm belongs to my parents. It is a place where children get to connect with animals. Most children today have no such opportunities and they completely revel in the time they have with the various animals there. Images courtesy Gerry Martin, the Alternative, the Guardian. Awesome Sandhya. Have been to the Gerry Martin Farm n times - the birthday parties there are the best simply because it is in the middle of so many awesome trees and delightful animals! The interview reminds me of Shekar Dattatri - he also worked with Whitaker, and I almost feel like he has replied to the questions - the respect they have for nature comes through in what they say. Waiting for an opportunity to send the kids to Gerry's workshops. what kind of books does he read?! Really enjoyed reading this interview, Sandhya ! Should visit his farm sometime. We love the farm and Gerry Martins father was a fab host too! I came to know just today, that on 2nd Dec 2011, Gerry received a Sanctuary Wildlife Award from 'The Earth Heros'. Shekhar Dattari was another of the awardees at the function. Here are the links.